What do I long or hope for? Well…for the longest time, it was to be successful. I wanted to be the best at my chosen field. I wanted to be recognized and appreciated for all the great work that I did. I wanted to be rewarded for my great accomplishments. As such, my world was chaotic for a long, long, loooonnnnggg time. Sadly, it was of my own doing and I am not proud of this fact. I was running in a million different directions, and truthfully, never really going anyway. Wow…another revelation for me. My desire at the time was to have it all. Why not! I was a modern woman. Why couldn’t I have it all? Unfortunately, I spent so much effort trying to get ahead that I forgot to enjoy the journey. Earned a college education – best thing I ever did. Got married – next best thing I ever did. That man saved my life. Lived in three different states – Wisconsin, Arizona and California. Too bad, I didn’t really get to enjoy them very much because I was working all of the time. Taken some really great vacations to Florida, the Bahamas, Yellowstone, Grand Teton, Yosemite and Grand Canyon National Parks, Oregon, Hawaii, & California (before we moved here) – don’t remember too much about them; need to resurrect the photos to trigger my memories. Bought a lot of really cool stuff…but then had to sell it because of the financial downturn in the market. Lost out on time with my family and friends, but met a couple of new and wonderful new friends along the way. Got in debt up to my eyeballs, got out of it and then did it again. Never had a child – not by choice, I wanted one desperately. My plumbing just didn’t work right. Never owned a house – again not by choice; circumstances were just against us. Had insomnia, heartburn, gained about 100lbs, separated several ribs, had breast reduction surgery, and spent hundreds of thousands of dollars on chiropractic care to fix my back because my insurance would not pay for it. Okay…enough! I think you get the picture. I thought I had it all, but the reality is I didn’t. When my life imploded on me, I finally realized that my “great” life wasn’t so great after all. Fortunately, I figured it out before something really bad happened. Frankly, after a year of picking up the pieces, I am glad that it happened. You see, I finally realized that I desired just one thing…peace. With that peace, hopefully I would have some tranquility and quiet time to figure out how I wanted to move forward with the rest of my life; or shall I say, the best part of the rest of my life. So today, I am working a less stressful job (no more insomnia and I get holidays all the holidays off! Woo Hoo!!!) and have accepted the fact that I am not going to be the “great” success I had hoped to be – no VP title with the corner office and the six figure income (I can’t believe I wanted that…ugh!) I still don’t own a home…yet. I don’t have any children, but am working on a plan. I’m still going to take some great vacations and currently planning the next one. And, finally, I am fulfilling the one secret desire I have always wanted to do; and that is to be a writer. I still need to make my way thru the maze that is this industry, but feel confident that I will navigate these waters. It might not be the right way, but it will be my way…because it is my desire. 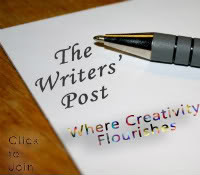 This post is written for The Writer’s Post Blog Hop# 21: Desire. Interested in learning more, please check out the link below!